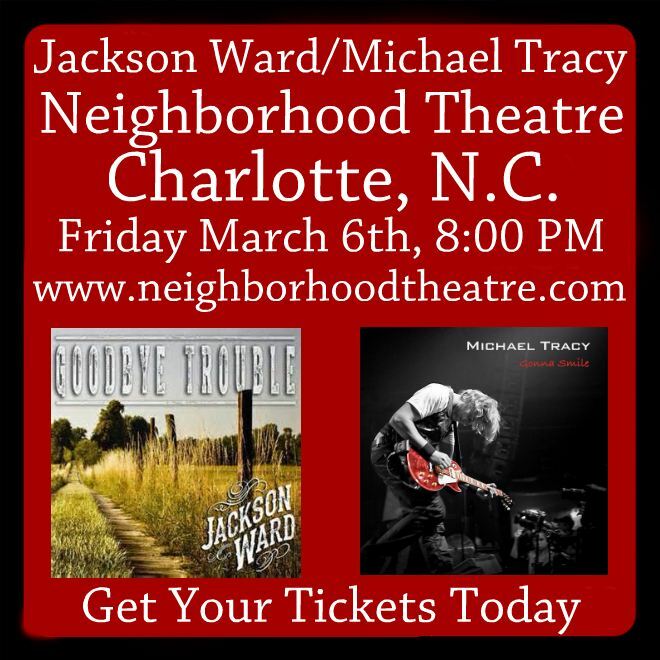 National recording artists Jackson Ward and Michael Tracy to perform at The Neighborhood Theatre in Charlotte, North Carolina, on Friday March 6th, 2015. Get your tickets today. CHARLOTTE, N.C. - Feb. 7, 2015 - PRLog -- National recording artist and Charlotte native Michael Tracy will be headlining at the Neighborhood Theatre on Friday, March 6th, 2015. Opening up will be national recording artist Jackson Ward from Richmond, Virginia. Michael Tracy's new worldwide album release "Gonna Smile" hit stores February 10th, 2015, earning rave reviews from music insiders around the globe. Request Michael Tracy's new single "Fashion and Fame" at your favorite radio station today. Jackson Ward's new album "Goodbye Trouble" is currently available in stores worldwide. They are playing in Charlotte on their tour in support of their new hit single "Goodbye Trouble (Drink by Drink)". Request Jackson Ward's new single "Goodbye Trouble (Drink by Drink)" at your favorite radio station today. Don't Miss Jackson Ward/Michael Tracy at The Neighborhood Theatre on Friday, March 6th, 2015 at 8:00 PM. The Neighborhood Theatre is located at 511 E. 36th Street, Charlotte, North Carolina.